Here’s a delicious smoothie for all you berry lovers. The three berries that comprise this smoothie recipe are blueberries, raspberries, and strawberries. All three combine for an antioxidant powerhouse. The primary free radical-scavengers found in all three berries are vitamin C and manganese, which are critical antioxidants for protecting the body’s tissue from oxygen-related damage. You’ll also get a good serving of heart-healthy fiber from this smoothie. I prefer using frozen (organic whenever possible) berries in my smoothies, but fresh are just as good. This recipe doesn’t mandate all three berries, substituting in pineapple or mango is just fine. Now to the recipe for this tasty treat. Enjoy! Place all the ingredients into your blender and blend until desired consistency is reached. 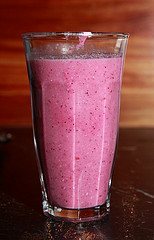 I would love to know if you try this triple berry fruit smoothie – please leave a comment below. Happy Blending! Sorry to hear you didn’t enjoy this smoothie. You’re right, it is a little runny. I’ve since updated the recipe. I add 1/4 cup of oat meal to mine with the triple berries and about 1 cup of fat free milk and it is delicious. I make this smoothie, but I also add blackberries and a few cranberries. Apart from the cranberries, all the berries are fresh and locally sourced. All I add is low fat milk and that’s my breakfast pretty much everyday. Very nice, James. Blackberries and cranberries are fine additions. You know you crafted a healthy smoothie when it keeps you full until lunch. Chia seeds, flax seeds, coconut and almond milk were excellent add-ons, Steph. Nice to hear you enjoyed it, Kylie! I thickened mine up with 7 ice cubes & added a bit of fresh lemon. very good! you can also you frozen yogurt or sorbet to thicken. Very nice, Paige. Yes, frozen yogurt and sorbet are good thickeners. can you use one cup of yogurt instead or the one cup of milk? Sure, substituting the milk with yogurt is a nice twist on this recipe, Julia. I like this recipe for breakfast using milk instead of water but I also add a wheatabix!sometimes I’ll add a bit of yogurt to thicken it up,helps me stay full for a good 4hrs! Very good, Gordon! I like the additions. Would it work the same if i put fresh fruits? Yes, it might not be as thick, but it will be just as nutritious and delicious. I would like to know how this will effect my blood sugars. How will this smoothie effect blood sugars? Will it spike or will it gradually rise? Great smoothie. I changed it up a little. 1 cup berry medley (blue black raspberries) 1 cup strawberries 1 cup Plain Greek yogurt 3tbs chia seeds & 1/4 cup oats and almond milk. Not sure what the GLycemic index or glycemic load but thought I would chance it as a type 2 diabetic. Thanks for the help!!! Nice to hear you enjoyed this smoothie and I love the changes you made! Can I add on heavy whipping cream also? And how much? Sure you can add heaving whipping cream. Once large scoop should suffice. I’ve been drinking this triple juice for the last 2 day in the morning. So amazing,that keep me full til lunch time around 2pm. it tasty but Does it help me to loose weight?